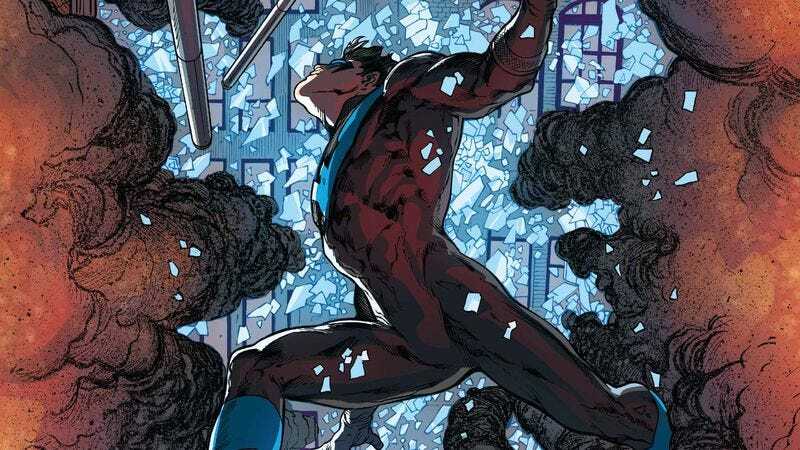 Nightwing is back in the crime-ridden city of Blüdhaven (his old stomping grounds in the pre-New 52 DC continuity), but it’s been a turbulent homecoming for the hero. He’s quickly found himself in the middle of a conspiracy framing reformed villains for the murders of major figures in town, and he’s teaming up with these innocent people to put an end to the killings before more of his new allies end up behind bars. Writer Tim Seeley has been doing fantastic work on Nightwing, and the current “Blüdhaven” arc has him bringing in old faces from the ’90s Nightwing series to pay tribute to the lead hero’s past while fleshing out his supporting cast in the present. Characters like Giz, Mouse, Thrill Devil, and Stallion haven’t been seen in years, but they’re back in the spotlight as members of the Run-Offs, a vigilante team that has gained Nightwing as its new leader. This preview of this week’s Nightwing #13 sees the Run-Offs charging into action to save the latest victim of the serial killer framing their friends, but the group falls apart when the heroes realize they’re too late. Artist Marcus To captures the degradation of the team’s confidence in the visuals, and the determination of that first image of the Run-Offs fades away once they realize the intensifying danger of this case. Seeley is working with a great line-up of rotating artists on Nightwing, and To’s artwork for the “Blüdhaven” arc maintains the dynamism and atmosphere that has defined this current volume of the series. Chris Sotomayor’s colors provide consistency across the different artists, and the gloomy palette of these preview pages indicates that things are only going to get tougher for the Nightwing and the Run-Offs moving forward.